Glasgow’s own A New International do things their own way. There’s a continental flavour to their songwriting, a sense of French sophistication or Mediterranean passion. Lush, cinematic artistry, the group have already built a reputation for themselves as one of Scotland’s most under-rated bands. New single ‘Valentino’ drops on February 12th, and it’s a lush, ambitious piece of work. Almost operatic in tone, it sits quite outside almost anything else operating in British music right now. Backed by some sumptuous visuals, A New International are a group who don’t want to hide away, who aren’t content to simply shuffle onstage. They’re a group with an identity, one that demands to be heard. Plugging away at the Scottish music scene for more than a decade and a half, Biff Smith’s group The Starlets built up an affectionate following even as they registered minimal commercial gains. 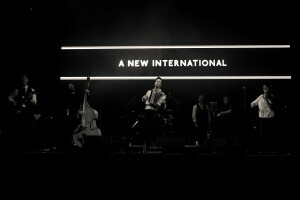 Having mutated into A New International last year, the new name seems to have brought with it a fresh impetus – this debut album was recorded in Sheffield with Richard Hawley producer Colin Elliot, and it’s not just a majestic, distinctive piece of work, but one whose grandeur and ambition speak of resonant self-confidence. From the swooping, mariachi-style anthem Valentino to the horn-caressed balladry of the title track and the Brecht-meets-Barry swoon of The Life And Times it’s an irrepressible and easy to adore piece. ‘Valentino’, the opening track of A New International’s debut Come To The Fabulon is all swirling strings, twanging guitars and latinate rhythms. It’s a preposterous and giddy thing. With the refrain “We come here to break your heart”, it’s a big bold statement of intent. The rest of the album magpies from pretty much every vaguely European tradition. Be it reclaiming the polka (‘Theme From Valentino’) and chanson (‘Marie Claire), or out-Harveying Alex on ‘Come the Revolution’. What makes this so good (and it is damn fine stuff) is the solid seam of melodicism running through the album. Above and beyond all, the tune is king. ‘I’m Your Kinda Guy’ is the kind of thing we hoped Robbie Williams was going to start producing when he started working with Stephen Duffy. You’ll swear blind you’ve known and loved ‘Our Time Was Like A Dream’ all your life. As the name would suggest, there’s a thread of big-P politics through the album too. A New International seem keen enough on revolution, but it shouldn’t be mistaken for surfing any Brandian zeitgeist. ‘The Land Reforms’, for example, is both defiant and hopeful. Like the singalong at the close of a ballot count, when you’re down but never beaten. Don’t make the mistake, though, of thinking this to be a genre-thieving grab-bag of styles. The album is cohesive. A singular vision. A recognisable band. It’s spaghetti western night down the Brigate Rosse social club. It’s the soundtrack to Aznavour and Brel wrestling naked in front of a fire. It’s also one of the most lush collections of sheer pop majesty you’re going to come across this year. Go on, treat yourself. You never know, they might just break your heart. Glasgow’s A New International make music with style and panache, they recently released their debut album ‘Come to the Fabulon’ which has blown Louder Than War’s Adrian Bloxham away completely, read what he thinks below. This captured me instantly, from the first roll of drums and cymbals with the soaring strings, this record had me. A New International have a heart of beauty and love. They sing of romance and revolution. As they say in the wonderful first song ‘Valentino’ ‘We come here to break your heart’. A New International hail from Glasgow but their heart and soul comes from the sounds of the hopes and dreams that burn inside all of us, the wishes and regrets that simmer underneath the surface just waiting to burst into the candlelight. This is the music I can feel playing on the rain drenched terrace of a rundown, broken Mediterranean terrace as I dance with a stunningly beautiful stranger, our limitations and inhibitions lost in the moonlight and pouring rain. It’s the cracking sound that a broken heart makes as it glimpses a lost almost forgotten love kissing someone else. The ache inside when your lover is far far away and you need them next to you. It’s a call to arms, a herald for violent revolution and the regret and sadness of turning into those that you despise. It’s an utter triumph and you need to hear it. There’s a dark undertow to the bright horns and upbeat drums in the plaintive and lost sound of the lyrics, for every ‘Theme from Valentino’ with its flamenco joyousness there’s a slow, measured epic like ‘Once upon a time in the revolution’ with its regret and sadness. To get the idea I’m afraid you are just going to have to listen to the record, I’m sorry, but there you are, you put the album on and it will get you, just like it got me, with the first roll of drums and cymbals. Then, just like me, you will find that it gets even better and at the end of the final menacing and regretful ‘Come the Revolution’ you will find yourself wanting more. Listen, buy and immerse yourself in A New International. It’s unlike anything else I have heard this year and is all the better for it. 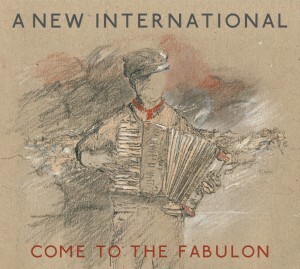 A New International’s Come To The Fabulon is an ambitious record, drawing its influences from many different folk traditions. Opener and first single ‘Valentino’ is as its name suggests, Latin and sultry, and builds to a crescendo before falling away into the gorgeous instrumental ‘Theme from Valentino’. Changing the tempo and style, a more UK folk sound is found in ‘Come To The Fabulon’, which quickly swims the channel to pick up a French style and language for ‘Marie Claire’. The second half of the album remains strong, instrumental ‘Once Upon A Time In The Revolution’ nods its head to Morricone, and does so with style, whereas ‘When I Walked The World’ comes straight from a café on the Boulevard Saint Germain. Occasionally the intros are so stirring and warming that the songs pale in comparison, and the lyrical content isn’t going to change the world, but that doesn’t take away from what they are trying to do with this album, straddling the globe, from spaghetti western to tango, from Parisian bar to home town folk. Whether you call them a much more earnest Gogol Bordello, or Calexico with a stronger drive towards pop, expect them to find their way onto the soundtrack of an independent movie sometime soon. So on Sunday night, the show began with an unfamiliar blast of amplified sound from outstanding Glasgow indie septet A New International, who sing strange, dark, cut-glass love-songs to a blazing accompaniment of violin, trombone, guitar, keyboard and drums; one lady in the stalls was seen to put her hands over her ears, but the music sailed on, in the eloquent voice of remarkable lead singer Biff Smith. For myself, as a critic, I would say that in her time-honoured way, the Lyceum responded best to the acts that offered the highest quality of writing, and the most powerful, disciplined and immediate approach to the audience; A New International, Chris Brookmyre, Rachel Amey and Luke Wright were the stars of the evening for me. Read the full review. Alluding to pre-gig nerves for this homecoming show, frontman Biff Smith recounts a tale of going for a “walk around the block” to settle himself before a teenage house party he once threw. Tonight as he arrives on stage he admits to having just completed a similar ritual. A New International are one of those bands who have been quietly causing a stir for years on the Glasgow (and very much beyond) gigging circuit. Bubbling under the surface it would seem, slowly and meticulously putting together the pieces, making sure everything is just right. Previously known as The Starlets until a couple of years ago these guys have been a bit of a slow burner. Now with the long-awaited release of their debut album Come to the Fabulon it might just be that the stars have fully aligned for them. Having opened with title track Come to the Fabulon Smith drops to his knees to face violinist Caroline Evens as the two duet beautifully on the movie score-esque intro to new single Valentino as the rest of the band await their cue. The band play through the jaunty Marie-Claire after which Smith cuts through the audience/band formalities and gives someone a couple of quid to get him a whisky. 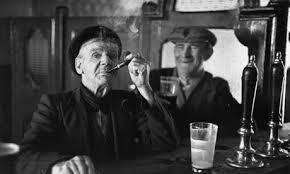 This being Glasgow on a Saturday night the crowd happily oblige. Their sound is hard to pin down, at times they have a real European, Gypsy-folk sound complete with accordion and Yann Tiersen seasoning. At others they remind me of The Coral on tracks such as I’m Your Kind Of Guy (a Starlets track) which tonight feels like it was played at double speed. The band run through a cracking cover of Jacques Brel’s Jackie nodding to one of their many influences and closing track Tenterhooks is another complete shift in sound and really finalises what has already been an incredible set from a band who look set to go on to great things this year. A New International are a rum proposition – take a noughties Glasgow should-have-been act, rip them up, retool them and relaunch with a new name and a wider, more international, if you will, outlook, and start again. Since 2013 the artists formerly known as The Starlets have been gigging around Scotland and beyond, building up some press attention and releasing an ambitious debut album ‘Come to the Fabulon’. A five piece (vocal/guitar/accordion, bass, guitar, violin, drums) joined by trumpet at times, they have a varied sound, recalling (for BM anyway) anything between Brel, Scott Walker, some of Mark Almond’s solo stuff, Band of Holy Joy, My Life Story and even at times that BM idol Amanda Palmer, now that really is a compliment. Vocalist and songwriter Biff Smith is an engaging presence onstage, dissolving the now pretty much full audience into fits of laughter in between songs with intended and unintended quips. There is no doubt though that this lot are still driven, somewhat battle-hardened, but still determined to do it their own way. This has moved in from beginning of the century indie-angst (although arguably The Starlets were never about that) to a semi-orchestrated series of mini-epics covering everything from European spies (‘Kim Philby’) to West Coast (of Argyll) dreamers (‘Under the Candle Window’). There are songs of lost love and regret as well, but also a lot of humour and warmth. Politics raises its head as well, with one number dedicated to “The Bullingdon Club”, Biff fairly spitting out the lyrics, more sneering than smiling. “Valentino” contains the line “we’d die for our art” which pretty much sums up what this band are about. In a world of You Tube-raised, stage school wannabees and posh sub-indie landfill (and worse), this is the real deal. Just before the end Biff reads out an extract from his blog (which frustratingly BM can’t seem to find online or would post a link*) which covers the local music scene in the 1980s (‘Glasgow, Centre of the Universe’) and a particular anecdote he was told regarding a £40,000 catering bill for one band’s second album Stateside sessions. Of course there will be speculation about which band this was (answers on the pelt of Jim Kerr’s mullet) but as Biff says, the sums amounts to far more than most bands will earn in their entire careers. The rest of the rant may have been in danger of coming across as sour grapes (we missed the feast, etc) but it’s done with such mordant humour and observation that it’s more of a Glasgow rock myth/ shaggy dog type story. They end with ‘Tenterhooks’, a majestic and rousing finale – may we see them back at the Glad, a bigger venue like ABC1, or even at Findlay’s karaoke some time soon. Biff Smith’s former Starlets are back with the shiny new name of A New International, but had the same personnel and played a short but perfect set which opened with ‘Fabulon’. The band had lost none of their unmistakable style of flamenco-infused pop , and there was plenty of new material, notably ‘Valentino’ and a lush cover of Scott Walker’s ‘Jackie’. Old Starlets’ favourites ‘I’m Your Kinda Guy’ and the achingly brilliant ‘Tenterhooks’ ended a brilliant set. The whole band are fantastic musically, it is not a one man show but an ensemble piece. “we come here to break your hearts.” Indeed they do with a sophisticated and romantically toned set that enthralls the crowd and a certain square dude with a camera. 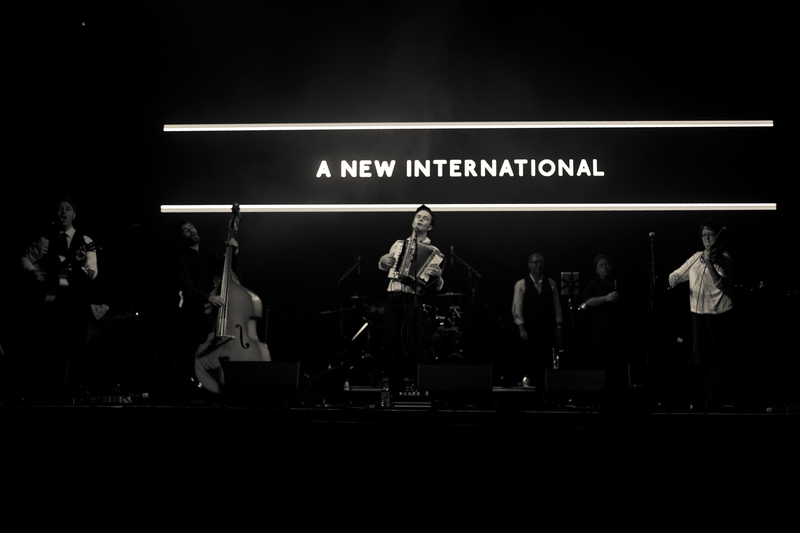 I’ll not bore you with my take on A New International further, other than to encourage you to see them live, close your eyes, and tell me where they take you. Read full review.